Gẖar kī nār bahuṯ hiṯ jā si▫o saḏā rahaṯ sang lāgī. Translation: Your wife, whom you love so much, and who has remained ever attached to you, runs away crying, "Ghost! Ghost! ", as soon as the swan-soul leaves this body. Translation: No one will let you stay, for even a while; they drive you out of the house. Now, let us see how these universal observations by Guru Tegh Bahadur Ji, in reality panned out in his own case. Guru Ji did not die a normal death, and interestingly even his dead body defied the normal fate. Guru Tegh Bahadur Ji sacrificed his life for the protection of Hindu faith in Delhi, during the reign of Aurangzeb. Under strict orders of forced conversions by the ruler Aurangzeb, the Hindus were forced to relinquish their faith to get relief from jazia tax and to save their lives. The poorer and lower caste Hindus accepted the easier option, by accepting the conversion. Now, the efforts focused on converting the higher caste Hindus-Brahmins, as that would open an easy way for conversion of the masses by the cascading effect. Alarmed Brahmins of Kashmir held their conclave and decided to seek help of Guru Tegh Bahadur Ji in Anandpur. Their delegation of five hundred came to Anandpur and narrated their plight to Guru Ji. Guru Ji, after deliberations and input from his young son Gobind Rai, suggested to Kirpa Ram, the leader of the delegation, a message for the ruler. The message was Emperor Aurangzeb should stop mass persecution, and if Guru Tegh Bahadur Ji converted to Islam then they all will follow suit. But if he fails to convert Guru Ji, further proselytizing should be stopped. On hearing the message Aurengzeb was elated and issued orders for Guru Ji's arrest and to be brought to Delhi. 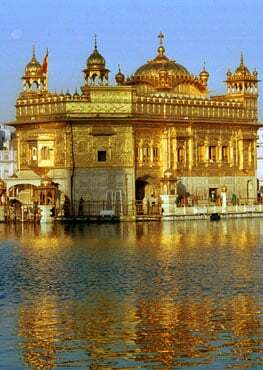 In the meantime, Guru Ji came to know of royal edict, and started his preparations for Delhi, without waiting for the formal summons to be delivered. Guru Ji was in Sikandra, the outskirts of Agra heading towards Delhi, when he made his whereabouts known through a shepherd boy, grazing his goats and sheep and was promptly arrested. He was brought to Delhi in an iron cage on November 04, 1675. Bewildered Aurangzeb asked Guru Ji, why he was offering himself for Hindus, who idol worship and caste system was not practiced and preached by founding Sikh Guru Nanak Dev or the subsequent Gurus? Guru Ji replied that Hindus are being treated as sub-humans and inferior in your reign, which is not fair. Guru Ji condemned use of force for conversion to Islam, adding that everyone should have freedom to practice their belief and faith. Guru Ji was then asked to show some miracles, which he firmly refused. Finally, he was told in clear terms that other option to not accepting Islam is to be prepared for death. First Guru Ji's companions Bhai Mati Das, Bhai Sati Das, Bhai Dyala were tortured and killed by sawing in half, boiling in a cauldron and wrapping in cotton and being put on fire respectively. However, all three stayed calm and steadfast in their faith, by embracing the death. Aurangzeb was hoping that seeing persecution of his close associates will waiver Guru Ji's determination, because his concern for their welfare, and also concern of his own fate. However, when Guru Ji's determination did not waiver, Guru Ji was beheaded on November 11, 1675 by Jalaludin at Chandni Chowk on the orders of his chief. The sacrifice touched the hearts of masses. People burst into loud shrieks, lamenting, with tears dropping from their eyes. 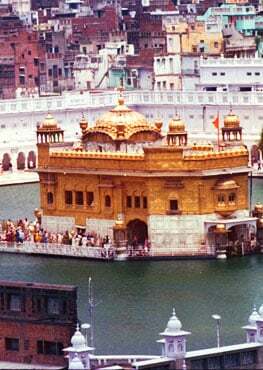 Today, a memorial Sis Ganj Gurudwara stands there in that place honoring that unique and supreme sacrifice. The ruler and his coterie had planned that the next day the body will be cut to pieces and hung on the various gates of Delhi, as a deterrent message for the residents. Suddenly, a large dark cloud enveloped the sky, and a severe dust storm started blowing as if nature was also expressing solidarity with the grieving masses. Translation: He protected (with his life) the forehead mark and sacred thread (of the Hindus), which marked an unparalleled heroic event in the Dark Age. For the sake of saints, he laid down his head without a groan. These words do perfectly paint and convey a true assessment of the momentous task undertaken by Guru Ji for right of freedom to practice their beliefs by Hindus. We cannot find another instance and a parallel, where someone laid down their lives for protection of other's faith. But we can find quite a few examples, when someone laid down his own life for protection of his belief and faith. Guru Gobind Rai arranged the cremation rites of the severed head in the compound of their residence. 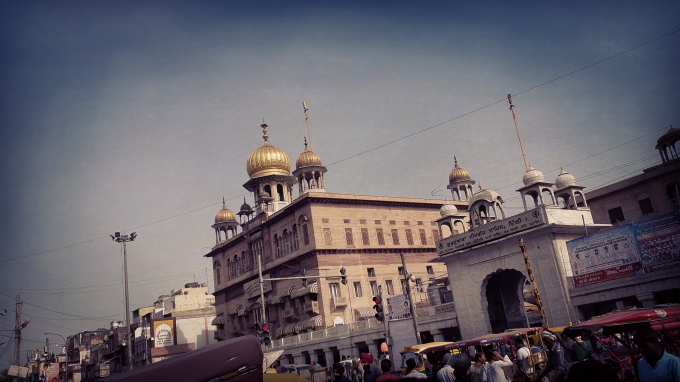 There stands a magnificent Gurudwara commemorating this unparalleled feat, where thousands visit daily and bow their heads. In the mean time the body was picked up by Bhai Lakhi Shah, who happened to be in the vicinity unloading lime from his carts at the Red fort for royal forces. He quietly lifted the body despite the raging storm in his bullock cart and moved it to Raisina, his home. He drove the cart with the body into his house, and set the house on fire to cremate the body by creating the impression of accidental fire. Here, we can see a devotee and man of faith, bringing a dead body inside his house, contrary to normal traditions when everyone normally takes the body out. While the people are afraid the visit the cremation grounds in darkness of the night, this place has become a place of reverence and is visited by thousands day and night. Today, we have befitting memorial at Chandi Chowk, Rakab Ganj, Raisina in Delhi, where the martyrdom took place and body was cremated. 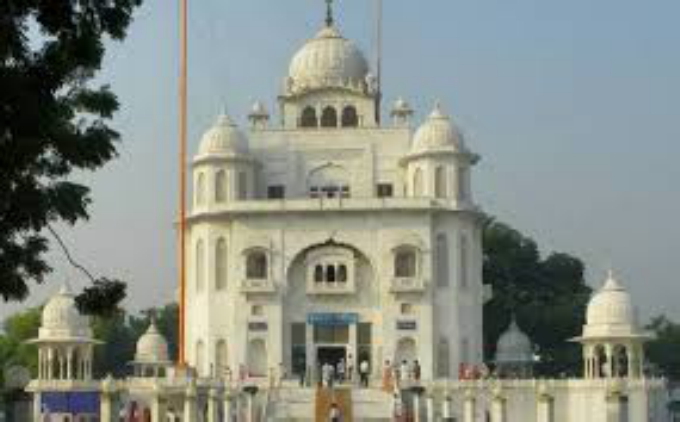 There is also a memorial Guru Ka Taal Sahib in Sikandra, Agra commemorating the place of arrest of Guru Ji. There is yet another befitting memorial in Anandpur where the head was cremated. 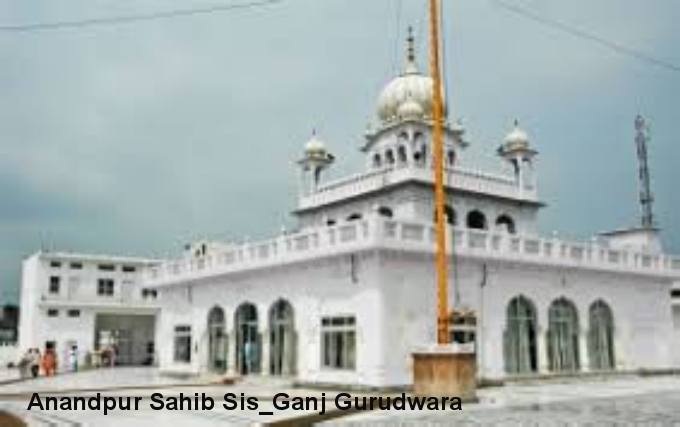 Also there is another memorial called Gurudwara Sheesh Ganj, Taraori, in Karnal district, commemorating the stay of Bhai Jaita there for a night's rest on his journey to Anandpur. 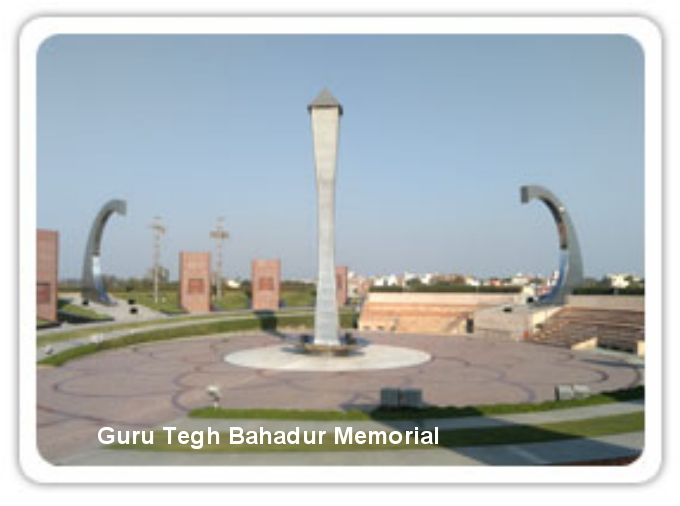 Recently a new memorial, called Guru Tegh Bahadur Memorial park on G.T. 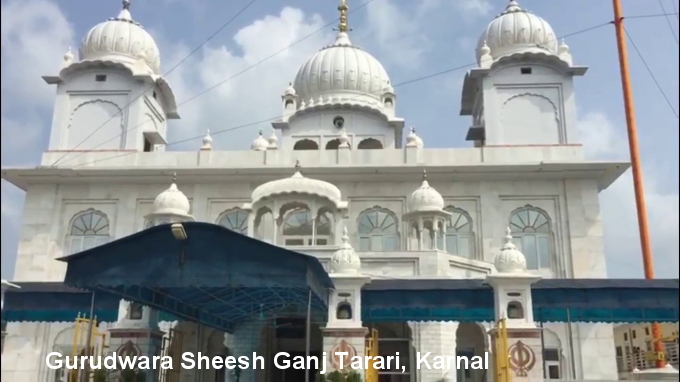 Road towards Karnal has been built in honor of indomitable spirit of Guru Ji and his three companions. We have seen the how these numerous memorials commemorate the indomitable spirit of Guru Ji and his supreme sacrifice. Now, let us visit the burial site of the ruler who perpetuated this gory act. 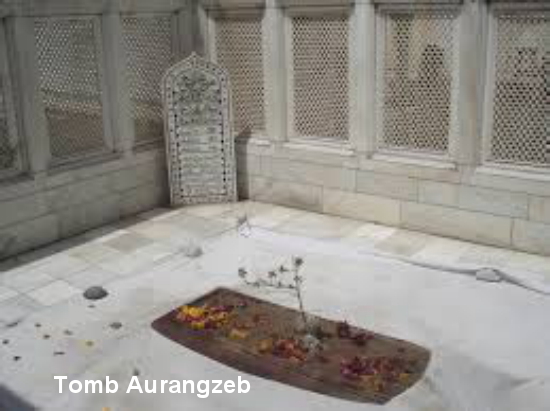 In the image we can see the tomb of Aurangzeb, in Aurangabad, the city named after him. There is no canopy over the tomb and so few visitors are visiting to honor him. In contrast the indomitable spirit and supreme sacrifice of Guru Tegh Bahadur Ji is strongly itched in the memory of the masses. It continues to inspire people today and will continue to do in the days to come. The universal truth that Guru Ji expounded about the fate of dead body, does not apply to his body, because of supreme sacrifice that Guru Ji did to protect freedom of Hindus to practice their faith.